High speed rail is a fantastic sustainable alternative to cars and planes for longer distances. This is why countries such as Spain, China or the United States are currently working or plan to work on such projects. Due to halve the time necessary to link by train the capital to cities like Edinburg, Glasgow or Manchester, the £34bn ($55bn or 38bn €) project would build 1,500 miles (2,400 km) of tracks by 2020. An interesting feature of this project is that it would complete the European High speed rail network in a great way. Over the past few decades, the United Kingdom has fallen behind its European peers, having failed to develop intercity high-speed rail lines even as France, Spain, Germany, and Italy expanded their networks significantly. The completion of the Channel Tunnel Rail Link in 2007, however, brought Eurostar trains from Paris and Bruxelles into London at high-speeds for the first time and whetted the country’s taste for faster trains. 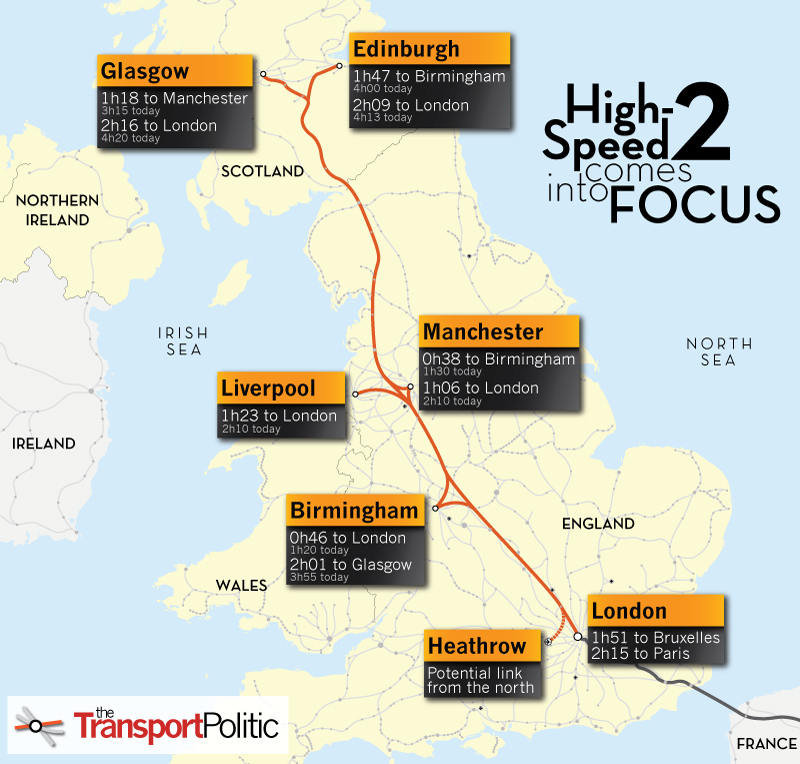 Since 2008, the Conservative Party has been campaigning actively for a new 200 mph north-south line connecting London with the country’s major regions, and the ruling Labour Party has slowly come on board. Today, the U.K.’s track owner Network Rail released a report proposing the construction of a new £34 billion mainline from London to Scotland. Trains could be in operation in ten years. (…) As expected, though, today’s report indicates that the country’s new line will run north from London to Birmingham, Manchester, and Glasgow and Edinburgh. The route is not yet finalized, but the map above gives a general indication of its path. Though Network Rail will not manage the construction of the line, its study is in-depth enough to merit considerable discussion by the authority created this spring to contract out the new line, High-Speed 2. HS2 is working on its own report on the new high-speed line and will publish it at the end of the year; it is highly likely that the governmental organization will endorse a very similar route as that proposed by the national track owner, since it will connect the U.K.’s first, second, third, and fifth-largest metropolitan areas (London, Birmingham, Manchester, and Liverpool) and its most promising new potential rail market (Scotland). This high-speed line’s construction is now virtually certain, as it has acquired the support of politicians on every side of the country’s political spectrum. Today’s report indicates that a line running simply between London and Manchester would not be economically beneficial, but, counter-intuitively, that a longer a more expensive project reaching up into Scotland would pay for itself 1.8 times over a 60-year timetable, including the costs of operations and maintenance. That’s because while rail already commands a majority share of journeys between the capital and locations south of Manchester, airlines control the market to Scotland, which would be within two hours of London with HS2. The construction of the line, which could be completed by 2020 at the earliest, is expected to mostly replace domestic air travel in Great Britain, cutting down on carbon expenditures significantly. ← Could the US tax more gasoline ?